Among the crowd of Crossover SUVs, it is difficult to choose the one that will pay you back all the amount you have invested. This difficulty is because almost every auto making brand today is releasing a model that has several rival counterparts launched by other automakers. But a brand like Mazda has the diligence to offer you a solution to this, and no, it is not only their marketing strategy that will finally convince you to buy one model from tat house, but its utility and performance level that you might not get in such a reasonable price tag. 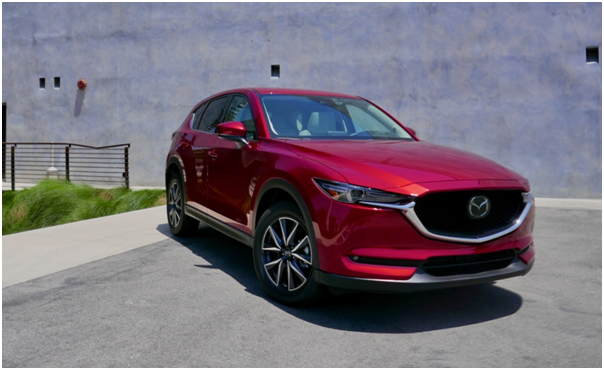 The 2019 Mazda CX-5 is one such crossover SUV that really made people change their minds at the last moment, in case they come across this car before making the purchase. To let you know, what it has to offer, here is a brief note on that model. Once you look at the design of the 2019 Mazda CX-5, it will appear to you more of an artwork than an engineered moving product. The entire structure of the CX-5 is wrapped with a sophistication that keeps your eyes locked for a while. To start with, thefront grille that now looks more like ashield leaning forward a bit, while theLED headlights sitting next to the grille turns on with a divine glow illuminating your path ahead almost as clear as daylight. Take a walk around the CX-5 and you will find each and every component holding a unique look, be it the slanting windshield, the lower roofline or the smartly cut doors that open to invite you inside its cozy interior. The cabin of the 2019 Mazda CX-5 is crafted with the same flow of artistic line, making the most of the space allotted for it. The cabins of the CX-5 is made of premium quality materials and vary from one trim to the other in offering cloth to Nappa leatherseats and upholstery, as you climb higher the trim levels. Mazda has always been a keen observer of the market demand, and that gets reflected in the way it arranges its model series. The 2019 Mazda CX-5 as a crossover SUV series too comes in tree trims, to serve the different level of demands of performance. The engine options too vary for the trims depending upon which one you choose. The starting level of the trims that includes the Sport, Touring, Grand Touring, are powered with an inline-4 engine that cranks up a 187 of horsepower when paired toa 6-speed automatic transmission and can be driven with the optional All-wheel drive. Mazda has always contributed the automotive industry with effective safety solutions. The 2019 Mazda CX-5 is one such model that keeps you protected from every possibility of collisions with the help of advanced safety and driver assistant features likeautomatic emergency braking at full-speed, blind-spot monitors, active lane control and adaptive cruise control. In brief, the 2019 year model of Mazda CX-5 has every good reason to get enlisted among the best of crossover SUVs till date.